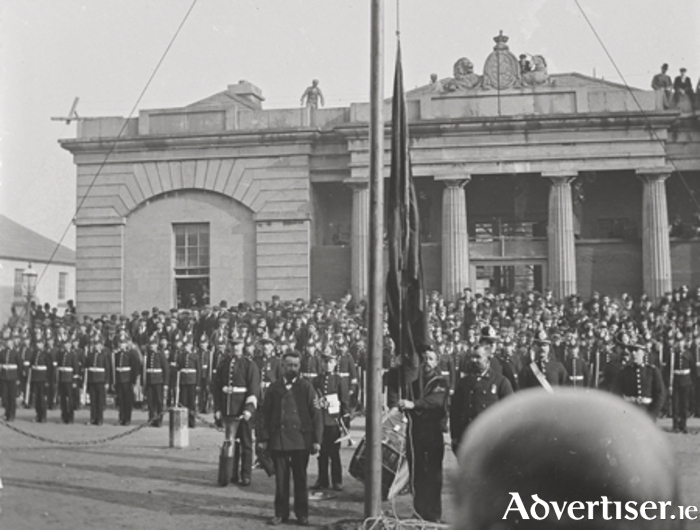 “The accession of His Majesty King George V was proclaimed in Galway at 2 o’clock on Saturday (21st of May, 1910 ). The ceremony was performed by the High Sherriff, Mr. Cecil R. Henry, and took place opposite the Courthouse. On the steps of the building there was a fashionable gathering. Outside the hollow square formed by soldiers and police, the crowd was one of immense proportions. About one hundred men of the Connaught Rangers, with their band and the King’s colour, under Major Sarsfield, were formed up in line opposite the Courthouse, and an equal number of the Royal Irish Constabulary, drawn from Galway and outside stations, filled up the remaining sides of the square. They were in charge of Co. Inspector Flower, Districts-Inspectors Mercer and O’Rorke. The ceremony was carried through most successfully. Lord Clonbrock, wearing the uniform of the Lieutenant of the County, with the light blue sash of the Order of St. Patrick; and the Hon. R.E. Dillon, wearing the uniform of a Deputy Lieutenant, accompanied the High Sherriff. At 2 o’clock Mr. Henry, taking up a position on the steps of the Courthouse, read the proclamation, and at the close, the Royal Standard was unfurled at the improvide flag-staff. Soldiers and police having given the Royal salute, the band played “God Save the King”, the refrain being sung by some of those present. Mr. Henry then called for three cheers for the King, and the soldiers and police responded with their helmets off. The troops having presented arms, cheers were again given for the King. A voice took up the singing of “God Save the King”, and again its singing was repeated. A number of students of University College, who occupied a position on the steps of the Courthouse, called for three cheers for Queen Mary, and the response led to a renewal of cheers. No music was played on the way to or from the Courthouse, and the drums were muffled, as prescribed, in crepe”. This was how a local paper described the proclamation of George V who became king on the death of his father Edward VII. It is interesting that the account makes no mention of any protests, though I am sure there were some. Just barely visible inside the door of the Town Hall is a lot of scaffolding as if they were working on the ceiling inside. The carved stone coat of arms on the roof was similar to another on top of the Courthouse. One of them is now in the grounds of UCG. A week after the proclamation, most of the shops in the city closed for the King’s funeral, and a memorial service was held in the Collegiate Church. This photograph (from the Clonbrock Collection in the National Library ) will be included in a major exhibition on the ‘Decade of Revolution’ which will open next month in Galway City Museum. It will feature a lot of artefacts, posters, photographs, news clippings etc and should not be missed. They are still collecting material, so if you have anything that might be of interest, please contact Brendan McGowan at the Museum. The Old Galway Society host a lecture this evening in the Victoria Hotel at 8pm. The title is “Marriage Stones”, it will be given by Jim Higgins and all are welcome.